Eastern Market is the largest public market district within the United States. Serving Detroit for 125 years, the district covers a six-block area just northeast of the city’s central business district. The district serves as both a piece of the city’s past and a portal into a healthier and sustainable future for its economic resurgence. Of important note, Eastern Market’s business mix and the potential of that mix to economically anchor a community are conditions that cities across the country can utilize to their own economic benefit. According to the Institute for the Competitiveness of Inner Cities, food businesses employ the widest range of skills among all economic clusters. 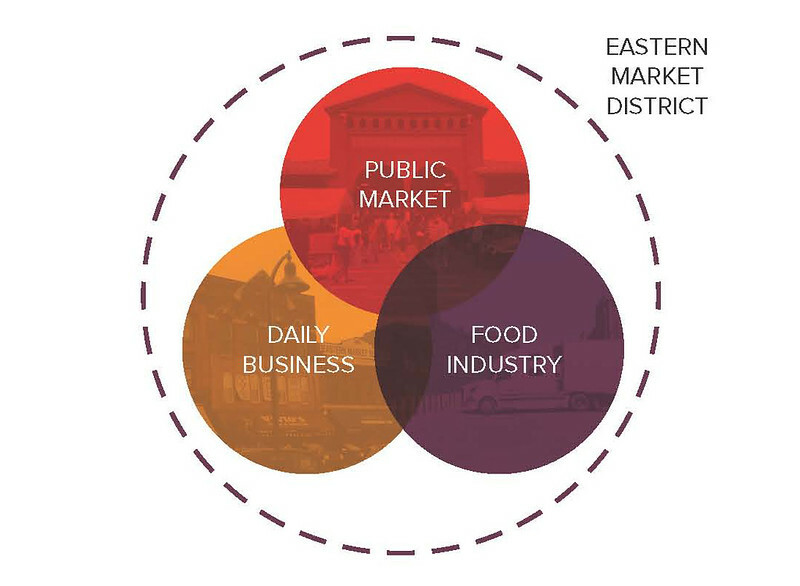 In its simplest form, the Eastern Market District is regional food business hub anchored by a hybrid retail/wholesale public market. An important element of the working food district is its natural ability to promote entrepreneurism across economic classes. Not only is it home to a cluster of food related wholesale businesses, this densification of complementing uses is complimented by light manufacturing and makerspaces. The foot traffic stimulated creates an environment for ancillary uses such as independent eateries, retail, galleries and performance spaces. Annually, over 2 million people shop and buy food at Eastern Market, spending $418 million on meat and $360 million on wholesale food. The impact of this activity is the stimulation of 1,300 jobs for the local area. A significant portion are entry-level, living-wage jobs. In short, the district has become a local business incubator with the ability to organically revive and economically anchor the larger community surrounding it. 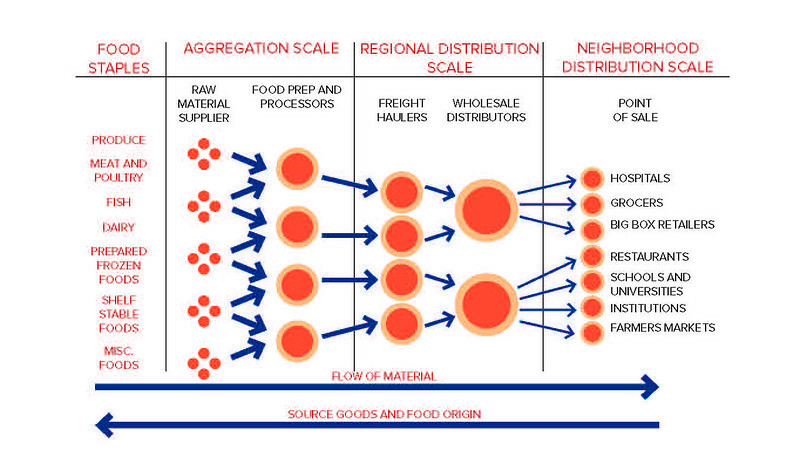 While this is great for the City of Detroit, the reality is that areas of food related wholesaling business clusters exist in most regions across the country. 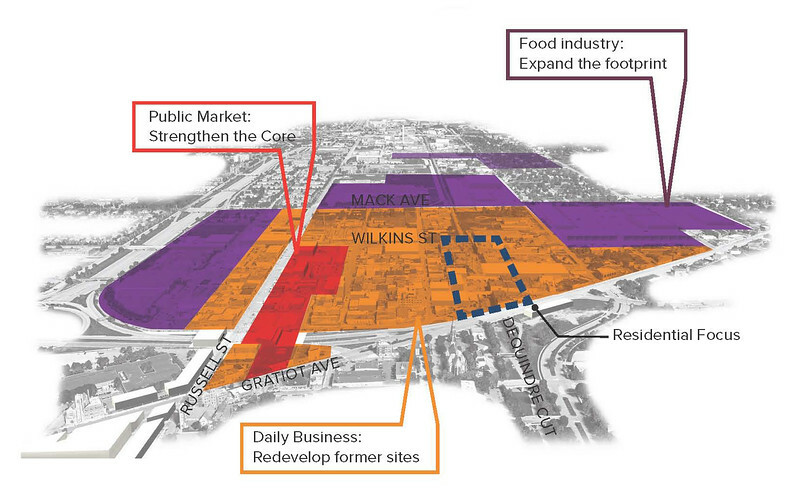 The Eastern Market District serves as an economic example of success of combining the concept of unified promotion, urban planning and local history with the clustering of complementing uses within a compact pedestrian scale setting. Here’s a brief visual look at a true American economic success story that could be replicated in urban communities across america.